This packaging is virtually the same as the Totally Natural variety. The difference is a cartoon style font that explains the contents are Canyon Cut in a bold burgundy strip across the middle of the bag. The blue bag also has repeating background graphics of the Ridged Chips inside. It's a good design, but the lettering doesn't quite take itself seriously enough when compared to the rest of the range. 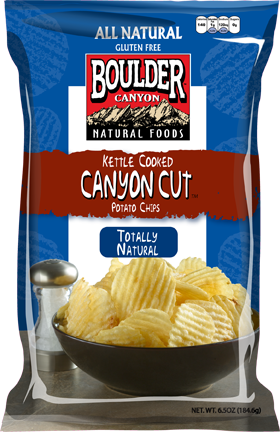 While these are not necessarily thicker than the standard Boulder Canyon Kettle Cooked Chips, the Ridged nature of these gave them a very good crunch. A hard, biting snap, crackle that made them seem fresh and firm. 'Canyon Cut' is a good phrase. The Ridges are not quite as wide as the Grand Canyon (! ), but it is a nicely spaced marcelled Chip. The Kettle Cooking has not affected the seasoning; there is still plenty of residue to get your fingers mucky with. The Chips were thick enough to maintain a bag full of mainly whole Chips. The Nose Plunge Test revealed a rich potato smell that certainly seemed natural enough. The Chips are minus lots of the bad things in Chips such as Trans Fat and Cholesterol and the warm, creamy potato taste made them a very good sandwich partner. Aside from the rippled design of the Chips they tasted the same as Boulder Canyon's regular All Natural Chips; a bit greasy, a bit potatoey, a bit plain.